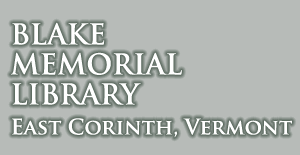 On April 24, 2018, the Blake Memorial Library Association convened for its Annual Meeting. At the meeting, the library Board of Trustees shared conceptual plans for library renovations, which were designed in partnership with architect Jay White and based on the library’s latest Strategic Plan, feedback from the community, and the library’s vision of being a community “living room” for the residents of Topsham and Corinth. The library believes the proposed renovation plans reflect community needs, as laid out in our latest Strategic Plan, including more open and flexible community spaces and increased accessibility of those spaces. The renovation design planning is being carried out by an ad hoc committee of Board members and interested members of the community, whose task it is to make renovation recommendations to the Board of Trustees. As of today, both the heat pump and parking lot projects are complete. Stop by and check out our expanded parking lot and relocated stone wall! 1. The library Trustees agreed to hold off on beginning the major interior renovations until approximately the winter of 2019-2020. This will allow the library to apply for accessibility and other grants. The grant deadlines and funding cycles necessitate pushing the renovation timeline back. The library is moving forward with the parking lot expansion and the heat pump system installation in the fall of 2018 as stated below. 1. hire architect Jay White to turn his conceptual design floor plan into blueprints that can be used to put the project out to bid. 2. expand the library parking lot by moving the current parking lot stone wall back to the library property line. This project will take place in October 2018. ** Street parking only will be available during this time. 3. replace our aging oil furnace with an energy-efficient heat pump system, which will also provide dehumidification and air conditioning. This project will take place in September or October 2018. ** The library will remain open during this project, although there will be some disruption due to a crew working with ladders and power tools, mostly on our lower level. Some areas of the library may be temporarily closed when the crew is working in that area.